Living in California for the last 20+ years, I see people who are homeless more than I ever have in my life. As the weather gets bitter, I shudder when I think about men and women sleeping on cardboard in San Francisco. I’m also haunted by the growing number of homeless teens I see hanging out at a local gas station. And I know there are so many more…. It is not my imagination that there are more homeless people in the Golden State. Latest statistics show five states—California, New York, Florida, Texas, and Massachusetts—accounted for more than half of the homeless population in the United States. This past year, according to US Department of Housing and Urban Development, California experienced the second-largest increase in the number of homeless people among 50 states. 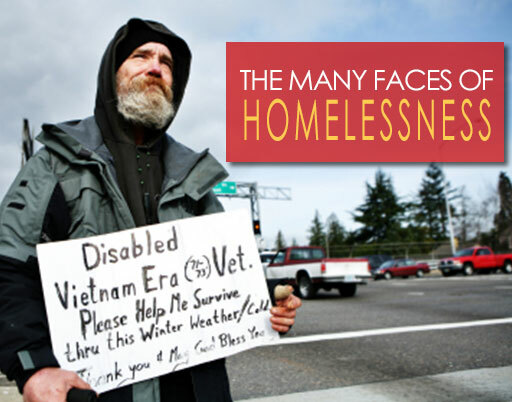 On any given night, the National Alliance to End Homelessness says nearly 579,000 Americans are homeless. Of that number, more than 362,000 are individuals, and over 216,000 are people in families. While homeless young people are more transient and challenging to count, it’s currently estimated that about 50,000 youth in the United States sleep on the street for six months or more. It’s hard not to look away from the homeless—in person, and in my heart. Whenever I’m asked for money or read a sign someone is holding at a light or freeway ramp, I get skeptical and wonder how they’d use any money I give. So I pause. The most recent data shows, in general, that the number of people sleeping in shelters and transitional housing is increasing. This suggests communities and nonprofits are doing a better job getting people off the streets and under a roof. To me, that seems like a good place to start helping. The next time you’re in an area where you expect to see a homeless person, bring along an extra cup of coffee, sandwich, or a meal package with protein-rich foods like trail mix and beef jerky (the most sought-after food). If you have the time, take the homeless person to a nearby fast food restaurant to order the meal they want. Contact your local shelters and ask what they need. (You can find one in your city here.) Are there specific food items they’re short on? Or are blankets, clothing, socks, band aids, lip balm, lotion, children’s toys or something else more in demand? Share the season’s spirit of giving; get your family involved in buying and dropping off a holiday care package. It’s easy to help prepare or serve a holiday meal at a local shelter or church this time of year. But volunteers are needed year round. What skills can you contribute? Consider volunteering on a regular basis, and offer to clean or help rehab buildings, design a website, provide accounting support, play with or tutor children, write resumes or help prepare a homeless person to interview for a job—depending on your talents. Access this directory to find an agency near you. For more charities helping the homeless, check out the JustGive Guide. 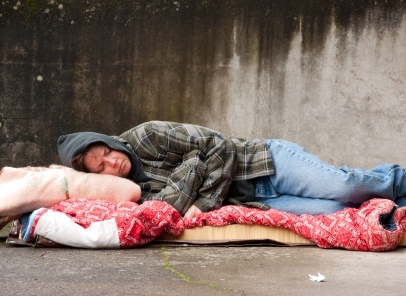 These are a few ways to help the homeless—here’s a list of many more. If you’re not in a position to do any of these things, remember that a smile, kind word and respect go a long way. People who are homeless deserve our empathy. As for me, I’m re-training myself not to ignore homelessness, and in any way I can, to help. Just as there are many reasons why people become homeless, I know there are just as many ways to start making things better. What does home mean to you? Is it simply the roof over your head? Your life’s savings or investment? Where you raised your children and where your family gathers for the holidays? Having a place to call home is the pillar of the American Dream and the center of our childhood memories. As the weather turns cold and plans center around festive gatherings, our homes become more precious than ever. And we think of those who are have no place to call home during our iciest and most challenging time of year. Despite growing up in a fairly affluent county in Northern California, my family is no stranger to homelessness. When there’s expensive rent, five mouths to feed, credit card bills, and trying to keep up with the Jones’ (or Kardashian’s for a younger reader) – everything can get turned upside down quickly when the primary breadwinner loses his job. For a short time while I was in high school, my sisters and I stayed with friends so our parents could get back on their feet when we lost our home. With “president” and “vice-president” of software companies to his professional credit, time and time again my father was denied positions for being over-qualified. He stayed in a shelter for months so that the money he earned working a retail job could contribute to a small apartment for my sisters, mother and me. Every weekend, we would open the door to groceries left on our stoop, a symbol of the indignity he felt as well as his desperate attempt to care for us in one of the only ways he could. We were fortunate enough to have family and friends to lean on, beds to sleep in, food in our bellies, and to remain in school. But my story isn’t uncommon nor is it the worst case scenario. With the state of the economy, fewer job openings and more layoffs, families across the country are at risk of losing everything. If you’re wondering how you can give back during this season, consider the following organizations and gift options that are close to my heart. You can make life better for individuals and families in need. This holiday, as you cozy up to the fire, light the menorah, hang twinkle lights on your roof, and sit down to your dinner table with loved ones… pause and think about ways to share your warmth and light with others. And give what you can to help the homeless find an affordable, safe and secure place to call home. Do you support a charity that does a great job of helping the homeless? Like us on Facebook and let others know.